DWOS™ Abutments & SRBB manages the design of custom abutments, implant bars and full virtual wax-ups for screw-retained bars and bridges (SRBB), while giving access to a wide range of implant systems. 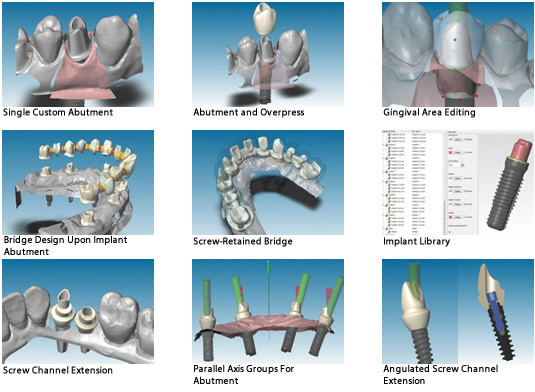 The design of all morphological elements of the prosthesis is fully integrated: the software automatically generates an anatomy to fit the custom abutment. DWOS™ ensures full control of the abutment’s critical parameters: emergence profile, clinical aspect, abutment screw opening and screw channel extension. The automatic management of parallel axes ensures perfect insertion of the bridge over abutments. Screw-retained bridges can be designed using the same easy approach as a regular bridge combining pontics with custom abutments. Our implant library contains an extensive range of implant systems that allows direct design of customized abutments as well as abutments on titanium bases. Additionally, users have the flexibility to create their own implant libraries. Regarding implant bar design, DWOS™ features advanced editing functions that bring highly precise custom results. When the scan of the model has been performed by one of our scanners (3Series or7Series), the software delivers a certificate that guarantees the precision. Our workflow eliminates the arduous need of handcrafting a wax-up. From the scan file with implant locators, the application suggests a full arch wax-up and its corresponding soft tissue. The final result can be a full contour screw-retained bridge or a framework of reduced anatomies. The elements of the prosthesis (occlusal table, gingiva line and insertion axis) can be easily adjusted. The anterior and posterior sectors can be moved as independent entities for more efficiency.